Welcome back to Alexis from I'M MAD FOR BOOKS, LUV and mine monthly book tag. I know that it has been some time since the last, but I am glad to me posting this meme yet again! 1) What type of art do you like the seeing most? I love love love digitally drawn pictures, though if I am going more for traditional look I love Oil paintings. Especially the ones with tons of texture. Does it count that I received Stalking Jack the Ripper fanart from PhantomRin? The very lovely Kerri mailed one to her loyal Knights of the White Chapel. If that doesn’t count then my last art related item would have been a new sketchbook. 3) What bookish animal would you like to see drawn? I feel like this is sort of a tough question, but if I were to see some bookish creature(animals) being drawn I would love to see colourful displays of the monsters and Phoenix from Amanda Sun’s Heir to the Sky. 5) Favourite cover illustration that was digitally painted? OMG if you know anything about me then you should already know my answer to this question. For the past year and a half I have been OBSESSED with the Air Awakens series, but better yet the cover of the series. 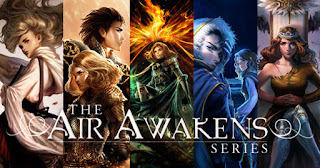 Okay so maybe you thought I was going to say that series, well I’m not. I thought Elise’s cover’s couldn’t get any better… well they did. 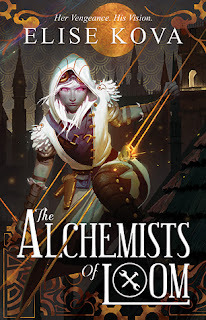 I am completely in love with The Alchemists of Loom cover. I could just stare at it all day and night. Elise has definitely been blessed with such amazing cover artists. 6) Who is a character you'd want to having drawing and inking lessons with? Who.. Who.. There are so many characters I could choose, so many who I want to choose. I think I would find drawing and Inking classes fun with Rhysand from A Court of Thorns and Roses mainly because I feel that halfway through he would decide to become the model to which everyone would then have to draw him for fun. 7) Favourite interior drawn design of a book? Six of Crows. Hands down. I knew the answer to the question before I even had the chance to type away. The inside of Six of Crows by Leigh Bardugo is by far one of the more stunning things I have ever laid my eyes on. 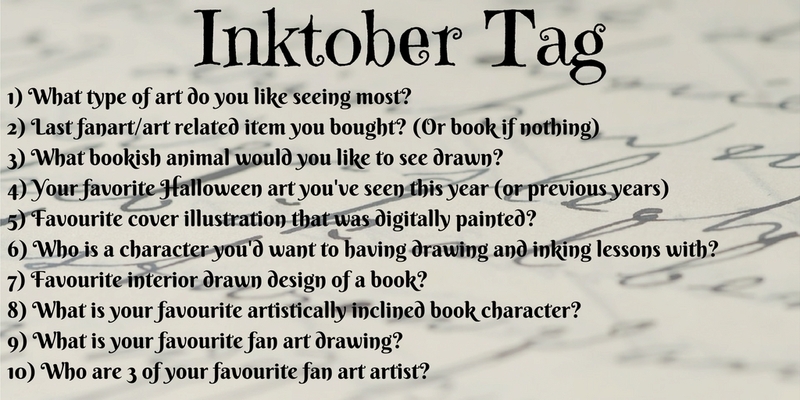 8) What is your favourite artistically inclined book character? I am taking a trip down memory lane and saying Alyssa Gardner from A.G. Howard’s Splintered Series. I was so in love with the fact that she was so creative throughout the whole series. 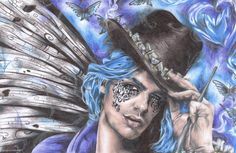 9) What is your favourite fan art drawing? 10) Who are 3 of your favourite fan art artist? My Number 1 definitely has to be PhantomRim. I am constantly loving their work and what they create. My second is Yuu Em, now she does fan art for Anime’s and they are just astounding. My last favourite fan artist is Cassandra Jean who has created some pretty amazing Cassandra Clare fan art. Did you like this tag? I personally LOVED doing this one. Which was your favourite question?